How do bridges and food connect? Both are vital to a highly functioning society and neither gets the respect they deserve. We count on Safeway to always have milk. Our favorite fast-food haunt satisfies any late night urge. Food is always available, except when it isn’t. 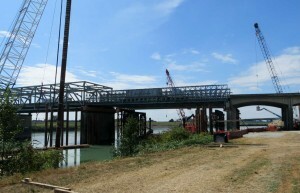 Calamities in food supply can happen just as unexpectedly as a Skagit River Bridge failure. Societies have had food disasters. Somalians in the early 1990’s lost 300,000 people to starvation and the 1996 North Korean famine left 600,000 dead. The 1930’s dust bowl which was instigated by substantial drought and poor farming practices in the Great Plains did not produce famine, but instead massive migration. Generally, Americans have been blessed with food abundance and cannot fathom insufficient supply ever being a problem. As a society, we have money and expect that we can either grow or import our food, if we need to. That is, unless we can’t. 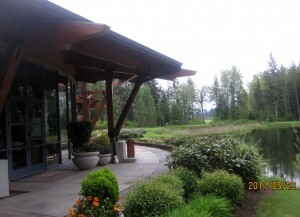 For 30 years I worked on permitting, designing and advocating for housing and commercial land development projects, including the mixed-age Snoqualmie Ridge and the seniors-only Trilogy at Redmond Ridge master-planned communities. Twenty years ago, both were controversial projects mired with in-depth environmental, engineering, legal, regulatory, and political review and approval processes. Having recently visited these projects and talked with residents, these developments have created stellar neighborhoods and communities. Despite the challenges, the developments satisfied a need by creating a place called home. With the anticipated population growth in the Puget Sound region, there continues to be a need to construct new communities and developments. More recently I added another layer of understanding on how land can be used. For three years, I led PCC Farmland Trust in its expansion from a one-person non-profit operation to a larger organization conserving and stewarding additional organically farmed property, doubling the donor-base, and tripling the revenue. But, more importantly, this experience expanded my understanding of the vulnerability of our farmlands and local food system. As with our bridges, our local food system would likely garner a C- , if grades could be calculated. Why would our food system warrant such a mediocre grade? The average age of U.S. farmers is 58 years old and close to retirement, which is close to the same age as the Skagit bridge. Just as bridges age, so do farmers. Who will be the next farmers that will grow our food? Many children of farmers have left the land to work in other businesses and professions. There are young people who are turning to growing food, but unless a farmer inherits land, it is too expensive to buy. The farming profession is poised for significant change with older farmers ready to go out to pasture and a small cadre of younger farmers interested in taking the farmers’ reins. Yearly, the average age of farmers continues to increase, indicating that the food growing vocation is not filling its ranks. City people (me included) want to protect farmland. We want local food. We value rural landscapes. We appreciate reducing the miles our food travels. We want to support our local farm families. We want to eat good, healthy food. But, here are the facts. 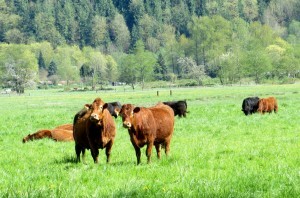 Based on the 2007 United States Department of Agriculture’s (USDA) Agricultural Census condensed by American Farmland Trust the average market value of products sold in in northwest Washington’s Whatcom County, is $3,182 per acre, the highest of the Puget Sound I-5 corridor counties, while the county just north of Seattle, Snohomish County is the lowest at $1,635 per acre. The average market value in the county just south of Seattle, Pierce County is $1,749 per acre, in the county about one hour north of Seattle, Skagit County farms receive $2,360 per acre and King County farms home of Seattle garner $2,582 per acre. Top crops in Whatcom County are raspberries, blueberries, strawberries, milk and dairy products and corn to create silage to feed the dairy industry, while Snohomish County’s principal crops are horses, nursery, greenhouse, floriculture, and sod. These revenues are good in the farming industry, especially in contrast with the average market value of $730 per acre in the number one agricultural county in Washington, Yakima County, located in eastern Washington, according to the USDA’s Agricultural Census. Compare this with a typical suburban icon, a Walgreens drugstore, which is indicative of any chain store whether a Starbucks, Safeway, or Taco Bell. According to the financial numbers given on the Walgreens website, their 14,500 square foot typical building footprint, selling 18,000 items, with 20 to 25 employees has annual sales of $8.7 million. 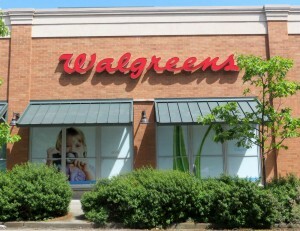 Using the commercial real estate standard, annual Walgreen sales are $600 per square foot per year. Compare earning 7 cents per square foot per year as a Whatcom County farmer alongside $600 per square foot gross per year as a Walgreens and it is obvious why the standard economic model favors development. Even earning 69 cents per square foot per year, a direct-marketing farmer does not even begin to pencil against Walgreens’ value either. Even so, food is vital to a community and fighting to save farmland is critical to our health and well-being. We all need food, unless we want to eat pabulum, which still needs to be made from products that are grown. We can support our Puget Sound farmers, by paying more for local farm goods, because we know it supports our rural families and landscapes and by supporting government policies and programs that protect farmland. We know we will never be able to increase farm values on par with that which is generated on commercial or industrial land properties, but perhaps we can show our respect for our food production lands by giving it the attention it deserves. Loss of farm ground is not as dramatic as the loss of a significant highway bridge, but each are as compelling and critical to our Puget Sound quality of life. Highways get immediate attention and investment to repair the vital transportation link. As we whittle away our farmland, we need to set an alarm as our food supply deserves the same, if perhaps not more attention than our transportation system.